The Raheel- Nawaz regime has announced its commitment to the American plan to remove Pakistan as an obstacle to India's rise in the face of China. 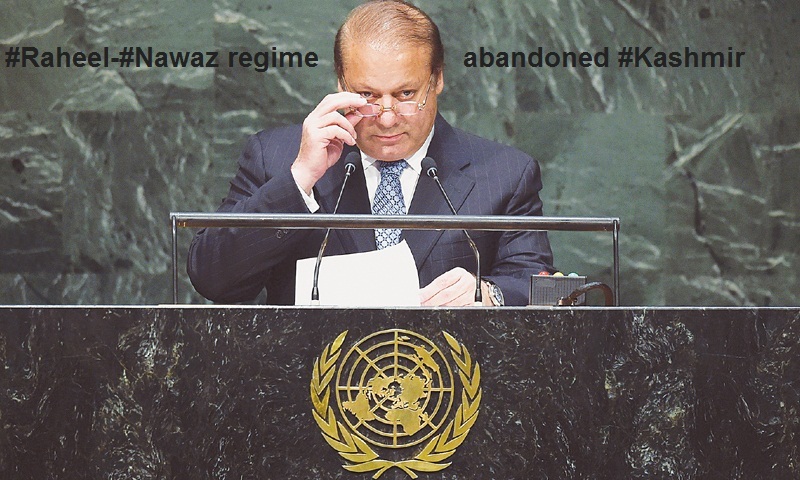 On 27th September Prime Minister Nawaz Sharif in the United Nations General Assembly said, "Pakistan wants to improve relations with its neighbours" and reminded the world that "the people of Jammu and Kashmir are still waiting for the fulfillment of that promise (plebiscite)” and hours before this speech on 26th September General Raheel Sharif declared, "The army is in favour of peace". For decades India has demonstrated great hostility against the Muslims, whether in occupied Kashmir, or in wars against Pakistan or even against Muslims within its borders, such as those in Gujrat. It is a belligerent hostile state. It spares no evil against Islam and Muslims and is known for calling for peace whilst hiding a dagger in its armpit. However, the masters of the Raheel- Nawaz regime in Washington demand that Pakistan lets down its guard before this untrustworthy state. It demands this so that the strongest Muslim state and the world’s only Muslim nuclear power does not stand in the way of India as the dominant regional power. America needs India to rise high above Pakistan so that it prevents Muslim dominance and challenges Americas competitor China. So Pakistan will be left at the mercy of Hindu justice, an oppression so severe that compelled Muslims to migrate in hundreds of thousands and sacrifice in tens of thousands to be rid of Hindu rule as a separate state, Pakistan. Hizb ut-Tahrir strongly condemns the treacherous stance of the Raheel- Nawaz regime and wants to make clear that the responsibility of liberating Kashmir is upon the armed forces of Pakistan. So, how do these negligent rulers call the same international community who created this problem and deliberately delay its just resolution so as to secure their interests? Hizb ut-Tahrir calls for the immediate reestablishment of the Khilafah which will liberate Kashmir and muster the strength of this regions 550 million Muslims as one force against their enemies. "جن لوگوں نے دین کی وجہ سے تمھارے ساتھ قتال کیا اور تمہیں تمہارے گھروں سے نکال دیا اور تمہارے نکالنے میں دوسروں کی مدد کی اللہ تعالٰی ان لوگوں سے دوستی کرنے سے منع کرتا ہے اور جو لوگ ان سے دوستی کرتے ہیں وہی ظالم ہیں"